The Community Development and Knowledge Management for the Satoyama Initiative Programme (COMDEKS) was launched in 2011 to support local community activities that maintain and rebuild target production landscapes and seascapes, and to collect and disseminate knowledge and experiences from successful on-the-ground actions so that, if feasible, they can be adapted by other communities throughout the world to their specific conditions. The programme provides small-scale finance to local community organizations in developing countries to support sound biodiversity and ecosystem management as well as to develop or strengthen sustainable livelihood activities planned and executed by community members themselves. The COMDEKS target landscape in Ethiopia is the Gilgel Gibe 1 catchment, located in the Oromia Regional State, about 260 km southwest of Addis Ababa and about 55 km northeast of Jimma. The COMDEKS target landscape in Ethiopia is the Gilgel Gibe 1 catchment, located in the Oromia Regional State, about 260 km southwest of Addis Ababa and about 55 km northeast of Jimma. The catchment, which contains the Gilge Gibe 1 dam (one of Ethiopia’s major hydroelectric power generating facilities), has a total area of 127,800 ha and is enclosed within four districts: Sekoru, Omo Nada, Kersa and Tiro Afeta Districts. The catchment area has a population density of 5.82 people per hectare, and the total population of these four Districts was estimated at 743,000 in 2010. The climate in the area is sub-humid and the main rainy season is between June and September, with a mean annual rainfall of 1300 to 2000 mm, and an average temperature of 17 °C. Topographically, the landscape is diverse, characterized by dissected plateaus, mountains, hills, plains, and valleys. The Gibe-Omo Basin, in which the target area is situated, is one of the major watersheds in Ethiopia, where three hydroelectric power stations generating nearly 2,500 MW of electricity are located. The basin is generally characterized by rugged topography and severely degraded ecosystems due to deforestation, overgrazing and poor land management associated with the subsistence agriculture that forms the basis of the local economy. As a result of soil erosion, the lifespan of the hydroelectric dams is threatened by siltation, on top of the sharp decline in agricultural production that has resulted from the loss of topsoil and organic matter. The natural vegetation of Gilgel Gibe catchment has been heavily cleared, except for some remnant scattered trees and shrubs and patches of planted Eucalyptus species. As a result, the surrounding hills are severely eroded. Many of the scattered tree species that remain (including Cordia africana, Albizia species, Croton macrostachys, Sesbania sesban and Millettia ferruginea) are incorporated in local farming systems, primarily to provide shade for coffee plants in home gardens. In the past, this landscape was characterized by dense natural forest with a variety of indigenous tree species, especially in the mountainous areas, which were a source of timber, fuel wood, construction materials and medicinal plants to some extent, and provided habitat for wildlife ranging from birds, bats, rodents, monkeys and waterbuck to carnivores like lions and tigers. However, at present, there are limited remnants of high forests, woodlands, riverine vegetation, bush lands, shrubs and man-made forests. Although there are no game reserves, various wild animals such as pigs, warthogs, apes, porcupine, spotted hyena, hippopotamuses, civet cats, baboons, colobus monkeys, foxes and antelope are still found in the area. Livelihoods within the catchment are very much linked to the sustainability of local ecosystems. Agriculture is by far the dominant activity. People in the area generally produce more than half of their annual food requirement in their own fields. The principal crops grown are maize, sorghum, teff and coffee, with maize both the most important household food source and the largest cash earner. The main livestock kept are cattle, goats, sheep, donkeys and chickens. Market access is considered good due to the number of all-weather roads in the area and its proximity to urban market centers. Land area cultivated, livestock ownership (especially oxen) and household size are the chief determinants of wealth in area households. Historically, the target area has produced a surplus of food, but beginning in 1997, poor harvests and the appearance of crop diseases such as grey leaf spot on maize have resulted in lower agricultural production. As a consequence, food insecurity has increased significantly, with 37 percent of the region’s inhabitants now experiencing some level of food insecurity. Failure by development organizations to encourage proper land use planning practices. With the support of Jimma University, a local academic institution, a landscape-wide baseline assessment was conducted in May 2012 to determine conditions in the target landscape. During the baseline assessment, COMDEKS Ethiopia piloted a set of socio-ecological production landscape indicators, developed by Bioversity International and the United Nations University, to measure and understand the resilience of the target landscape. These indicators were modified slightly to make them more applicable to the local context. Full and active participation of local communities and other key stakeholders in the baseline assessment was assured through a series of focus group discussions and workshops in which neighborhood groups and expert groups met separately with professional facilitators. These focus groups were conducted in the context of local social conventions, with men separated from women, to enable effective participation of women in the planning process and in the development of a resilience-strengthening strategy. In this process, a total of four men’s focus groups and four women’s focus groups were convened. The scoring of the resilience indicators took place at a separate workshop in which local experts and elders were trained in the indicator scoring. These experts were able to augment the information on landscape trends over time. Before the assessment, the target area was mapped so that the resulting maps could be used as a common reference point among the different focus groups and workshops. The results of the scorecard exercise were summarized and presented as radar diagrams. These were used to catalyze discussion with stakeholders on the goal and expected outcomes of the Landscape Strategy. The discussion also helped identify guidelines and project areas that CBOs could use as guidance to develop specific project proposals for community-based measures to mitigate the various threats identified in the baseline assessment. Using the landscape resilience indicator scoring and the community consultation as a basis, stakeholders and Jimma University facilitators drew up the COMDEKS Country Programme Landscape Strategy for Ethiopia, which describes the landscape, details local threats and opportunities, and sets out an integrated approach to build synergies among food production, sustainable rural livelihoods, and the conservation of biodiversity and ecosystem services. Table E-1 shows the four Landscape Outcomes around which the strategy is built, as well as the performance indicators that will be used to measure these outcomes. · Extent of improvement in the conservation of the dam. · Proportion of reduced siltation. Increased and stabilized agricultural yields through crop diversification, agro-forestry systems, tree plantations, integrated crop-animal systems and other approaches, as well as improved storage of agricultural products. · Number of hectares where more sustainable land use practices/systems are implemented by type: crop diversification, agro-forestry systems, tree plantations, integrated crop-animal systems and other defined approaches. Livelihoods of people in the landscape improved through developing eco-friendly small-scale community enterprises and improving market access. · Number of eco-friendly small-scale enterprises created for communities. · Number of households benefited from created enterprises. Effective community-based institutional governance structures in place for effective participatory decision making at the landscape level. · Number of community-based organizations established and strengthened who are engaged in integrated landscape management. · Number of people at different levels whose capacity was enhanced. Outcome 1: The severe resource degradation in most parts of the target landscape has been previously acknowledged by the government and remedial efforts have already been initiated with significant community involvement, especially in terms of construction of physical soil and water conservation structures. Projects under Outcome 1 should supplement and further scale-up these existing restoration measures. Among the priority activities is biological stabilization of the physical soil and water conservation structures through planting appropriate multiple-use species of trees, shrubs and grasses at critical points in the landscape. One direct result will be that the lifespan of the Gilgel Gibe 1 dam is extended through improved buffer zone and watershed management. For example, planting in the buffer zone of the Gilgel Gibe 1 dam will reduce siltation and thereby protect the dam, as well as providing a source of animal fodder and bee forage to support local livelihoods. Outcome 2: The landscape-wide baseline assessment indicated that the heterogeneity of the target landscape has changed over time, becoming a more homogeneous agricultural landscape, with reduced ecosystem and economic benefits to local communities. Nonetheless, traditional practices of maintaining diversified land uses and conserving biodiversity in agro-ecosystems do persist in some areas in the catchment. Community-based projects should aim to support and enhance these existing efforts by promoting agroforestry systems, integrating livestock and crop systems, diversifying crops, establishing plantations of multipurpose trees, and reducing crop loss through better storage practices. Outcome 3: The baseline assessment confirmed that poverty was the major driving force behind environmental degradation in the target area. Communities lack diversified livelihood strategies and hence are heavily dependent on land resources for their survival. The lack of alternative livelihoods has, for example, led to encroachment of the people into the dam’s buffer zone. Thus, attempts to ensure environmental sustainability cannot succeed if they do not at the same time improve and support local livelihoods. In the dam’s buffer zone, for instance, small-scale eco-friendly enterprises could be started with the dual purpose of contributing to the sustainability of the dam and the livelihood of the local communities. These enterprises include forage development and animal fattening through a cut-and-carry system, bee keeping/apiculture, and aquaculture. Moreover, improving market access through developing appropriate business plans should also be considered as an integral part of these small-scale enterprises in order to enhance the income-generating capacity of the CBOs engaged in the enterprises. In light of the heavy dependence on biomass fuel, the introduction and dissemination of energy saving stoves and other alternative energy technologies is also an area with potential as a small-scale enterprise with both economic and environmental benefits. Outcome 4: Decision-making at the landscape level cannot be effective without community-based institutions having the required capacities. Therefore, projects under this strategic outcome should focus on creating or strengthening existing institutions and organizations at the landscape level for more effective collective decision-making. Projects should ideally involve more than one community and be focused on activities and decisions that affect the management of the landscape and its elements as a system, such as developing or strengthening water management associations, producers’ associations, seed sharing networks, etc. Using these guidelines, 10 local projects in the Gilgel Gibe 1 catchment were chosen for the COMDEKS Ethiopia Country Strategy portfolio of landscape interventions, supported by grants to local community-based organizations of approximately US$19,000 to $27,000 (see Table E-2). It should be noted that these 10 projects are complemented by 12 additional projects of a very similar nature in the Gilgel Gibe 1 catchment that are also funded through the Small Grants Programme with GEF grant funding (that is, not with COMDEKS funds). Altogether these 22 projects bring to bear over $560,000 in funding for integrated interventions in the target landscape, greatly increasing the potential landscape-level effects. US$25,700 Outcomes 1, 3 Rehabilitate degraded areas around Gilgel Gibe 1 dam through closures to cattle grazing and other uses. Establish animal fattening enterprise using “cut and carry” fodder system. US$26,700 Outcomes 2, 3, 4 Sensitize and train the Cooperative members on the roles of integrated conservation and development strategies, such as planting of fodder species for animal fattening operations. US$25,300 Outcome 1 Restore degraded ecosystems by installing soil and water conservation structures such as check dams and bunds, and planting seedlings of multipurpose plant species on gullies, areas prone to landslides, and degraded riverbanks. US$27,000 Outcome 2, 3, 4 Train Cooperative members to carry out augmentation planting of multipurpose plants and shrubs in the catchment area and establish animal fattening operations. US$23,700 Outcome 2, 3 Carry out integrated natural resources management and alternative livelihood improvement on 100 hectares of the Gilgel Gibe 1 catchment. US$21,250 Outcomes 2, 3 Promote integrated conservation and development through improved aquaculture, animal fattening operations, and augmentation planting of multipurpose plants in degraded areas. US$23,100 Outcome 1 Restore45 ha area of degraded land by constructing bio-physical soil and water conservation measures such as check dams, soil bunds, and canals, and through revegetation. US$19,250 Outcomes 1,2 Establish nursery sites to produce multipurpose tree seedlings for revegetation and agroforestry systems. Rehabilitate degraded areas through area closures, supported with physical soil and water conservation measures, as well as planting vetiver and elephant grass. 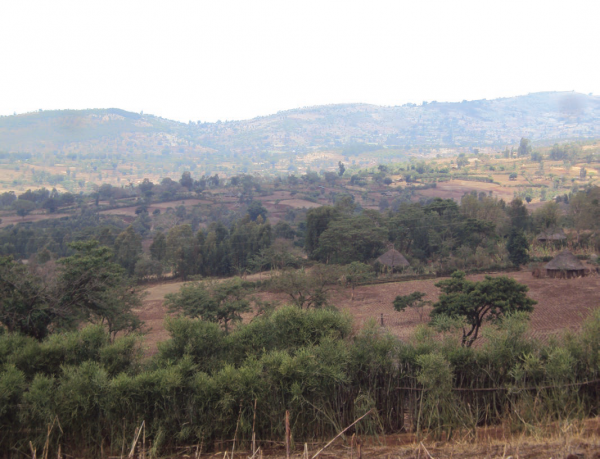 US$18,550 Outcomes 1, 2, 3 Restore 42 ha of degraded land through area closures and other means. Engage in honey production by putting the beehives in the closed area. US$22,150 Outcomes 2, 3 Undertake livestock interventions and promote modern beekeeping as an income-generating business for Cooperative members. Constructing soil and water conservation structures on degraded sites: All 10 CBOs in the target landscape participated in constructing soil bunds, cut-off drains, waterways, check dams constructed of live plant materials, the planting of vetiver grass, and other physical measures meant to reduce erosion and reverse soil degradation in the catchment. 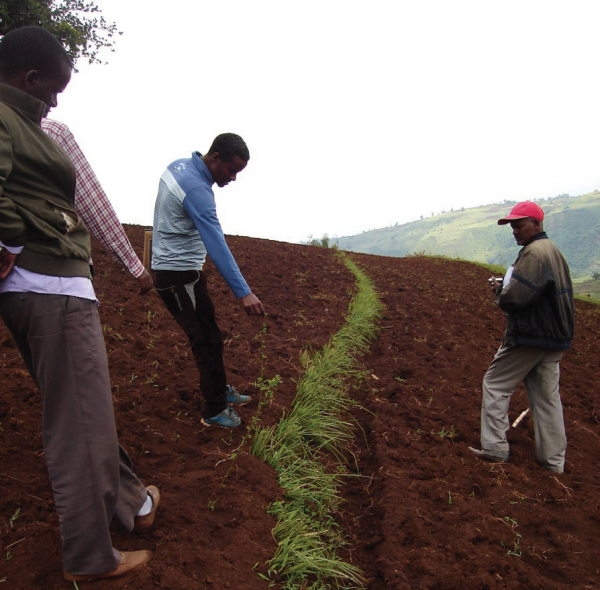 For example, members of the Urgaha Animal Fattening Cooperative in Sokoru woreda constructed 10 km of soil bunds, 1 km of waterways, 2 km of cut-off drains and 80 m3 of gabion check dams. In total, some 308 km of soil bunds, 16.4 km of cut-off drains, 13.2 km of waterways, and 28,500 m3 of live check dams have been installed throughout the catchment to date, which has mitigated some of the worst erosion. Rehabilitating Gilgel Gibe dam buffer zone through area closures and augmentation planting: In addition to installing physical soil and water conservation structures, community members in each woreda closed several severely degraded areas in the buffer zone adjacent to near Gilgel Gibe 1 dam/reservoir to all grazing and human use. For instance, GG Fishery Cooperative CBO in Omo Nada woreda closed 50 hectares of land from human and livestock interference. Similarly, Hortu-Gibe Beef Fattening Cooperative, Dawe-Gibe Animal Fattening Association and Jiru-Gudina Beef Fattening Association in Tiro Afeta woreda, protected 50, 16.5, and 20 hectares respectively. A total of 611 ha were closed in this manner throughout the catchment. Excluding human and livestock use allowed remaining vegetation to recuperate rapidly. Augmentation planting of multi-purpose trees, shrubs, and grasses complemented the natural regeneration. Together with favorable rains, many of the sites were substantially rehabilitated within 5 months. Encouraged by the success of the restoration, community members have committed to prepare byelaws to protect the restored areas from future grazing pressure and develop benefit-sharing mechanisms to share the assets that they have created. 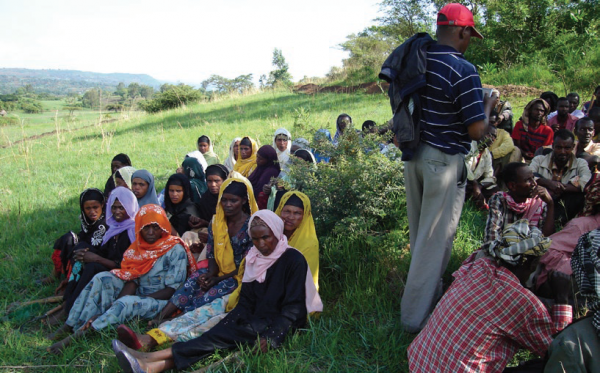 Establishing nurseries for grassland rehabilitation, agroforestry, and income: All CBOs in the target landscape are involved in the production of multi-purpose trees and shrubs at community-owned plant nurseries. Seedlings are sold to generate income and are also used for planting on degraded lands as well as on the private lands of community members. For instance, Burka-Gudina Honey and Wax Production Cooperative & Kake Integrated Conservation and Development Cooperative in Kersa woreda, raised 112,000 and 361,000 coffee seedlings, respectively. When planted on the landscape, nursery seedlings create multiple benefits: revegetation has cut siltation rates and increased ground water recharge; improved wildlife habitat; supplied fuel wood and construction materials for local consumption; and produced animal fodder and bee forage. In addition, locally produced seedlings have contributed to the up-take of agroforestry practices in the catchment. Introduction of leguminous tree species such as sesbania sp. and leuceana sp. into local farming systems has helped to increase the fertility and productivity of the soil, which in turn will contribute to crop yield increases. Introducing alternative income opportunities: Several projects in the catchment introduced income-generating activities such as cattle-fattening, bee-keeping, and aquaculture to local communities, who created cooperatives to organize these efforts. The animal fattening enterprises were conducted by confining cattle to locally constructed enclosures and feeding them using a “cut-and-carry” system using fodder harvested from closure areas where sufficient grass had returned. By keeping them confined, damage from animal trampling and overgrazing was avoided, which contributed to land restoration. Sale of the animals after fattening reaped significant income for the participating cooperatives. 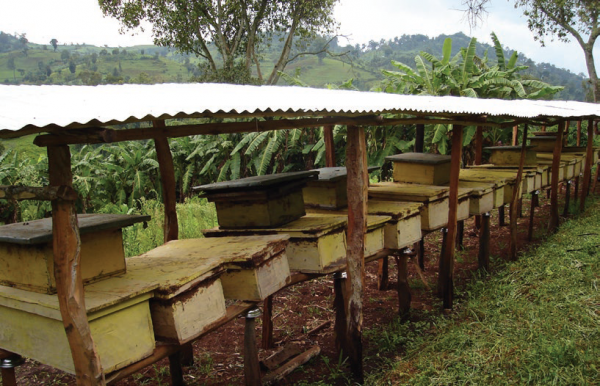 Likewise, several CBOs purchased beehives to establish bee-keeping enterprises. Producing and distributing fuel-saving cook stoves: Wood remains the main source of energy in the catchment, and the lack of alternative energy sources is a contributing factor to the area’s deforestation and land degradation. In Tiro Afeta district, the Biftu Fuel Saving Stoves and Seedling Producing Cooperative has begun to produce and sell energy-efficient stoves that allow users to cut their fuel wood consumption by 50 percent. In addition to providing a new income source for the cooperative, stove sales have helped ease pressure on area forests, reduce indoor air pollution and its associated health problems, and contributed to saving time for women and children who are usually responsible for fuel wood collection. 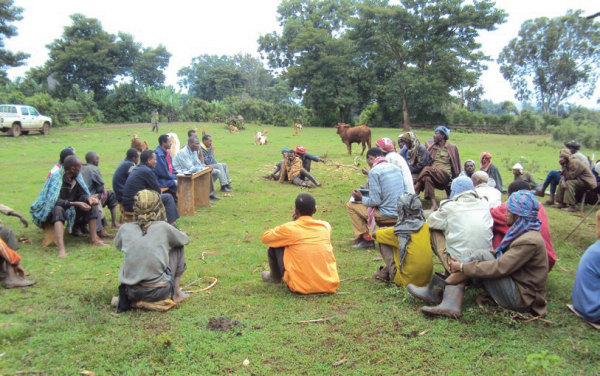 Establishing functional CBOs to undertake local landscape interventions: Prior to working with COMDEKS and SGP, there were very few community groups organized to pursue collective projects in the Gilgel Gibe catchment. That has changed with the advent of the COMDEKS portfolio, which put a premium on establishing and legally registering CBOs in the form of conservation and development cooperatives. These CBOs have their own bylaws, organizational structures, and documentation, and work closely with the local government. Simply having functional CBOs in all four woredas (districts) in the catchment that are capable of leading their own local development efforts is an achievement in itself. But they are also critical to the environmental sustainability of these local efforts and the acceptance of a landscape approach, since these CBOs have a long-term vision of improving community livelihoods while at the same time protecting local ecosystems. Their existence is also essential to catalyze and maintain the process of participatory decision-making. One indication that the local cooperatives are succeeding in their work is that their membership numbers continue to rise. Although creating area closures on heavily degraded sites requires substantial organization and effort, it has been an excellent way to create public awareness within the community about the need for new land management practices and the potential benefits when these are undertaken seriously. Because it required shared sacrifice and collaborative effort, the effort helped build a sense of community ownership of the project. Using the restored lands to support new cattle fattening and bee-keeping enterprises demonstrated the interconnection between interventions on the landscape and the benefits of an integrated approach. Ultimately, the problems of mismanagement and land degradation of the buffer area around Gilgel Gibe dam turned into an opportunity for communities who have used the area closures to create new income opportunities. Local CBOs face a considerable challenge in implementing landscape projects because of their lack of project management experience, emphasizing the need for capacity building and continuous support. Unfortunately, local government staffs who should support these CBOs often face a shortage of funds to provide this support. At the same time, the project life cycle is quite short, and does not factor in inevitable delays as community groups organize themselves and generate project proposals. Notwithstanding the challenges local CBOs face, the attitudinal change that has come both from the communities and local governments working with and through interested and legally recognized community organizations is very significant and is part of a long term solution to the social, environmental, and economic problems of the landscape. Nonetheless, it is clear that there will continue to be the need for broad-scale public education on the consequences of current destructive land uses on local livelihoods and ecosystems, and the connection between ecosystem recovery and greater economic and environmental security. This understanding, and the fact that communities themselves are given the main responsibility to manage local development projects, are the keys to the sustained community interest in landscape interventions called for in the Landscape Strategy. During the conduct of the landscape baseline assessment, it is very difficult for local communities to fully understand the landscape resilience indicators and score them appropriately, even with training. This reinforces the necessity of using focus group discussions, facilitated by expert groups of native language speakers, to interpret the indicators and draw out information and discussion that can be used to form the basis of the Landscape Strategy. In addition, creating separate focus groups for men and women is critical in order to address gender barriers and create a situation in which women’s input can be given full consideration.